There have been a number of biographies written on Alexander Wilson. Much of the information provided on this website comes from “The Life and Letters of Alexander Wilson” by Clark Hunter; the definitive biography of recent times, published by the American Philosophical Society in 1983. Alexander Wilson, near 10 years of age, was attending Paisley Grammar School when his mother died suddenly. According to George Ord in his “Sketch of the Life of Alexander Wilson” published in Philadelphia in 1828, Alexander's mother, Mary McNab, hailed from Jura, a woman of “fragile health... passionately fond of Scotch music.” This interest was successfully passed onto Alexander. The loss had a severe effect upon the family. Alexander was taken away from school and worked as a herd boy on a farm close to the border of Renfrewshire and Ayrshire. He was apprenticed as a weaver for three years around this time. James Southall Wilson in his work “Alexander Wilson: Poet Naturalist” published in N.Y. in 1906 informs us that the Wilson family comprised six members with Alexander being the fifth youngest. Three died in infancy, leaving Alexander with two sisters whom Clark Hunter identifies as Mary and Jean; Alex is assumed to be the youngest (Hunter makes no reference to the Wilson children who died in infancy). Alexander Wilson, Senior, a weaver, quickly re-married after the death of his wife, to a widow, Catherine (Kate) Urie, née Brown. Kate already had two children of her own and a third child, Janet, arrived through her marriage to Wilson. Wilson Sr. had a reputation for distilling whisky in illicit fashion, not a terribly disreputable business in those days. In this regard the Wilson family moved to Auchenbathie; the location being fairly quiet and remote. Clark Hunter dates the move as 1783, from the Cairn of Lochwinnoch, a manuscript collection held in Paisley Central Library. Auchenbathie (sometimes Auchinbathie, Auchinbothie, Barcraig Castle or Tower) refers to a ruined Tower House located in Lochwinnoch parish, Renfrewshire, close to Barcraigs Reservoir — roughly between Howwood and Lugton. The famous Wallace family of Elderslie owned Auchenbathie in the late 14th century [CANMORE: Archaeological Notes]. 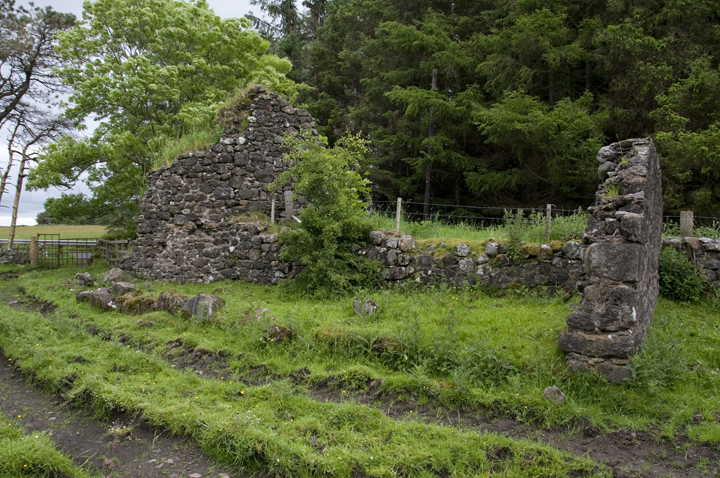 Auchenbathie Tower wall in rear, ruins of adjoining cottage or outhouse in front (photographed 2012). Today the site is more like an archaeological complex with ruins of later buildings adjoining, and close to, the tower, generally contained within the ruins of a farmstead-like perimeter. A further ruin exists on the opposite side of the road. An occupied house called “Tower Cottage” is located close by. According to Clark Hunter the Wilsons occupied a cottage that adjoined the Tower. The whisky still run by Alexander Wilson, Sr., he writes, was on the other side of the ruined cottage. CANMORE say that “a small building within the old walls is used as an outhouse for cattle (NSA 1845).” The ruins skirt the fence next to the road. However on the other side of the road, within the trees visible in the above image, are the ruins of another structure, suggested by some sources as being a possible smithy. 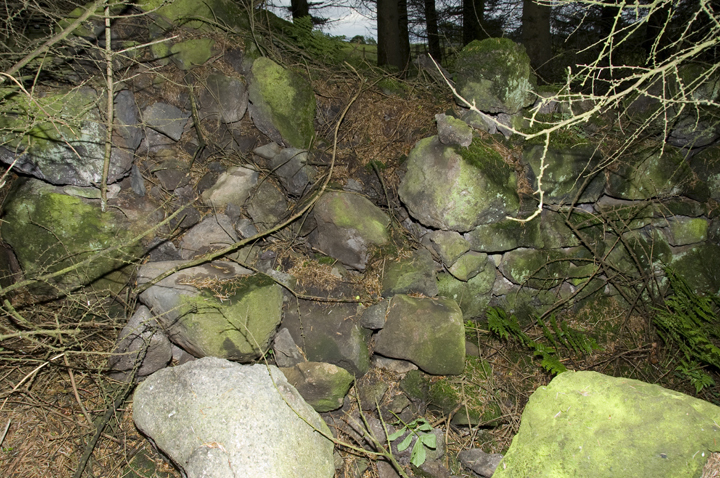 Ruin within wooded area in image top (photographed 2012). Alexander Wilson was now 17. He did not stay at Auchenbathie for very long. Clark Hunter reports that a relationship, deemed inappropriate, with a young handmaid, Meg Duncan, was catalytic in Alex’s stepmother, Kate Wilson, procuring employment and lodgings for him in Lochwinnoch as a weaver. The Wilson family continued to live at Auchenbathie until at least the early 1790s. 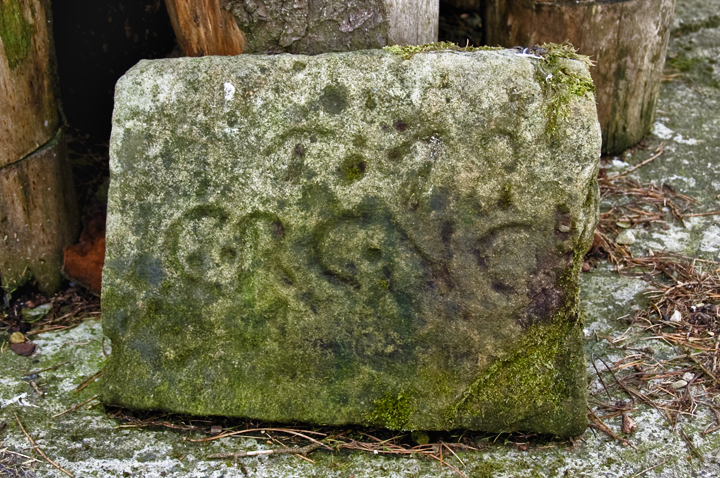 Carved stone from the original “Tower Cottage” in the possession of the current occupier. The carving reads: 1678 IC - RC - NC (photographed 2012).